Hello All! Boy has it been a crazyyyyy week. On the 4th, I turned 24. Um crazy, right? I know, I know. I look like I’m 12. I feel old now. Like 24 feels considerably older than 23. I feel like at 24 I should have my life together, but I’m still figuring things out. On another exciting note, my very best friend in the entire universe got ENGAGED. I am beyond excited for her, but also slightly weirded out at the fact that my bestie since the 4th grade is going to be a MRS!!!! K – I know you are reading this. I’M SO HAPPY FOR YOUUUUUUU! From patchwork vests to wedding dress (I had too ) Love you boo! 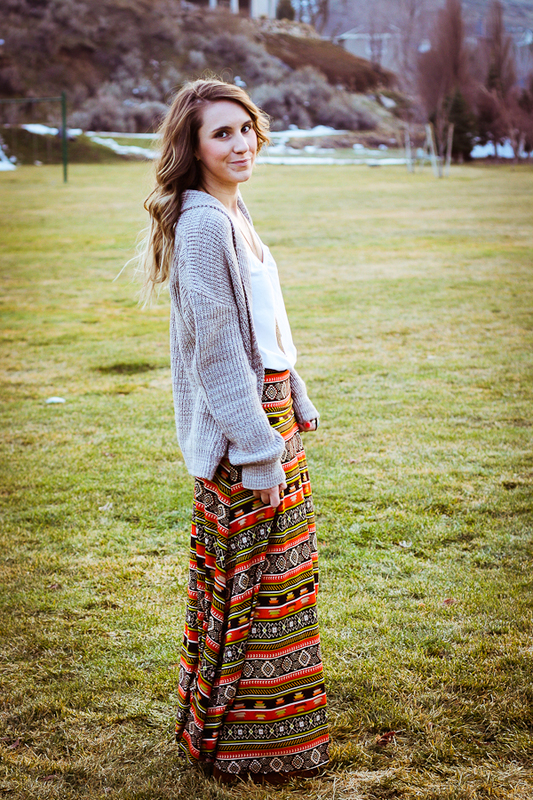 I LOVE knitted maxi skirts. I am obsessed with the versatility that they allow (they are so easy to style and dress up or down! ), along with the aspect of comfort. I’m pretty picky though when it comes to finding the perfect knitted maxi. I don’t want it to be too clingy or too loose or too long or too short…I think you get the picture. I am so lucky that LuLaRoe sent me this maxi skirt as it is seriously the ultimate maxi skirt….guys, I’m not kidding. Not only is it the perfect size, but also the perfect length, and the fit is flattering. The best part of all? This maxi comes in so many adorable patterns, I had a hard time deciding on one, but adore my pick of the bold, vibrant Orange Indian Pattern. Pairing it with a plain, slouchy tank and my new, favorite cozy sweater, I couldn’t help but add my Minnetonka boots and tribal necklace to enhance the native feel. safe to say that I have fallen in love with LuLaRoe, but so have many others. I love the fact that the owner, DeAnne, started by cutting skirts for her own daughters and has quickly expanded, selling over 7000 skirts, since August. Check out LuLaRoe HERE and I promise you will fall in love too!! So beautiful! 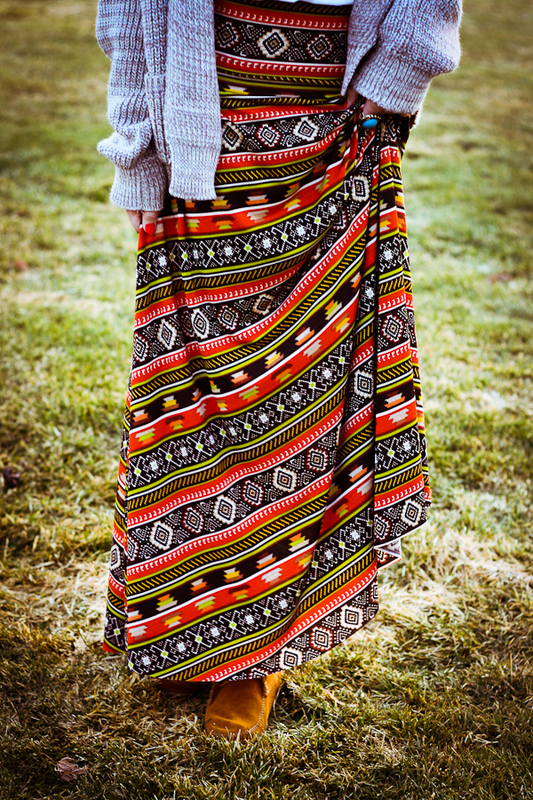 I love me a good maxi skirt and this one is beautiful. Also happy late bday! ooh, I love this outfit..so chic but looks SO comfy! You are so cute, girl! Absolutely beautiful maxi skirt!! 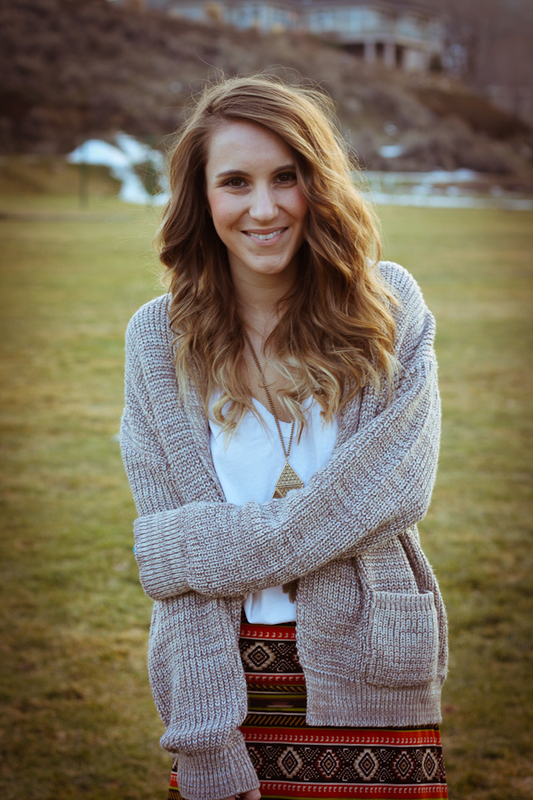 I adore this whole outfit – so cool and relaxed yet incredibly stylish and trendy! Perfect styling job! And congrats to your bestie and happy belated birthday! 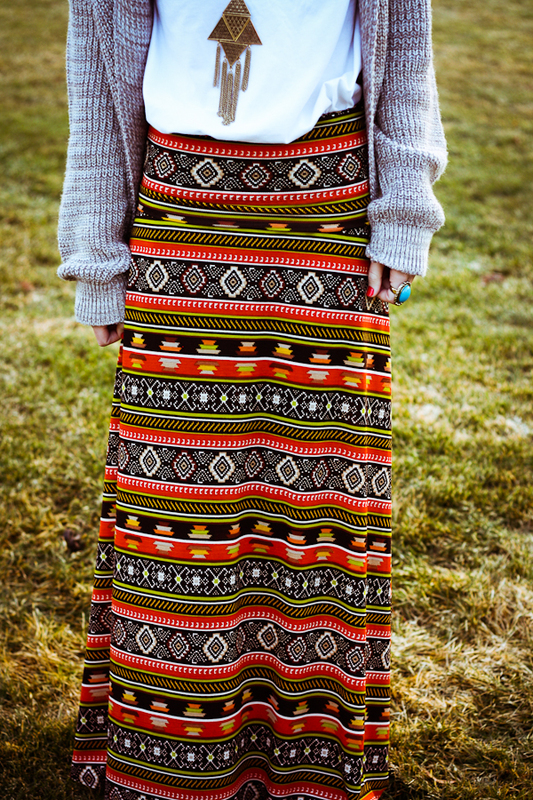 That maxi skirt is beautiful! Girl, you can pull off a bohemian style like no other! Aaaand, once again, happy birthday! February babies together 😉 Haha, I actually just had a friend I know get married, and it really is a weird feeling when someone that you've known for years is now a Mrs. 0_o But congrats to your friend! Love the outfit! 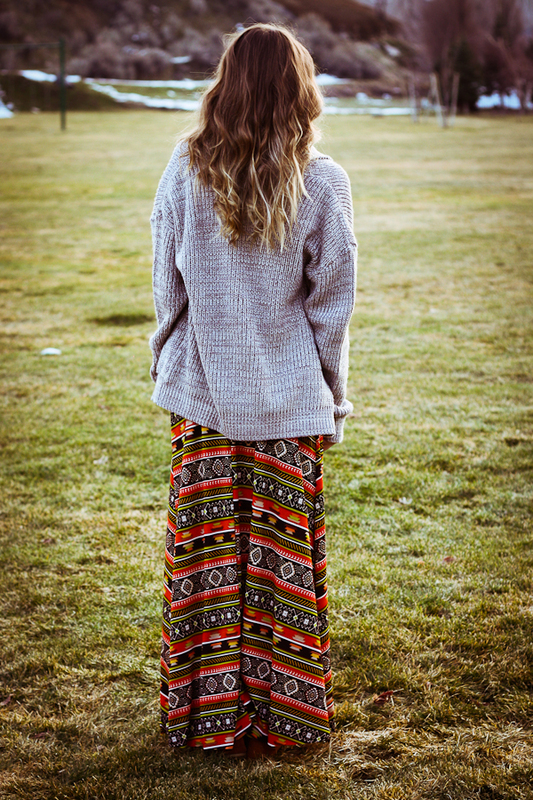 The maxi skirt isn't something i would west but it looks good on you! I love maxis and I'm so excited it's almost spring so I can wear them!! Cute look! Eeeeey pretty lady! I love the maxi here! And I like how you're wearing it with an oversized sweater cardigan like you are… it's so cute without being hobo old lady-ish! (that was my attempt at giving you a compliment, but I'm not sure if it came out quite right… well, it IS a compliment, haha). When people around me start getting engaged, I freak out a bit, 'cause I still feel so young! And wow, extraordinary outfit, the maxi skirt is the prettiest skirt I've seen in a while!!!!!! 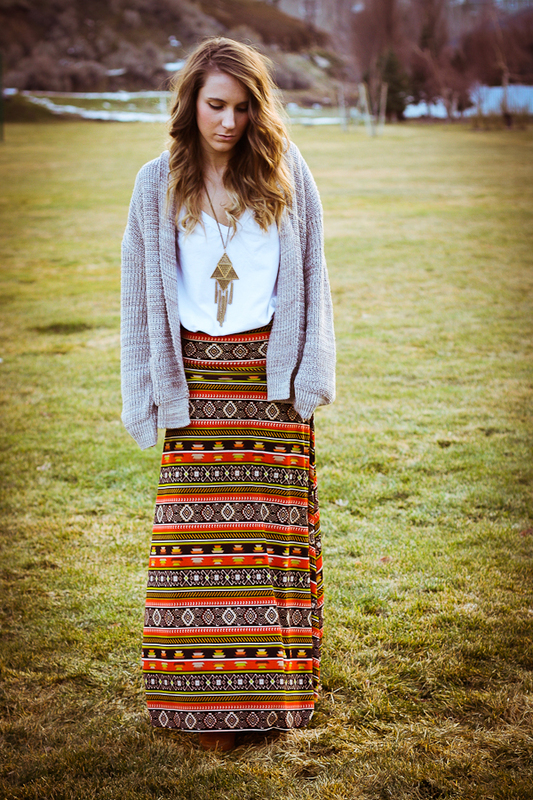 I absolutely LOVE that maxi skirt, especially with the oversized cardi – so cute! I love the print on this skirt. And I love how you styled it with the bulky cardigan. Such a perfect look for transitional weather. This isn't a skirt I'd normally take a liking to, but you've styled it so well! I love it. It really suits you. That is such a beautiful skirt! Very Boho-chic! Happy belated birthday! 🙂 That skirt is AMAZING….And 24 is sooo not old. 44 is. Trust me, I know. Looks beyond comfy & cozy, love how you styled it! Ooh, this skirt is so fun and looks incredibly comfortable. The necklace matches it perfectly. And happy birthday and congrats to your best friend! what a great skirt! and i love the necklace with it! such a cute and cozy outfit! Oh my goodness.. I'm in love with this entire outfit! 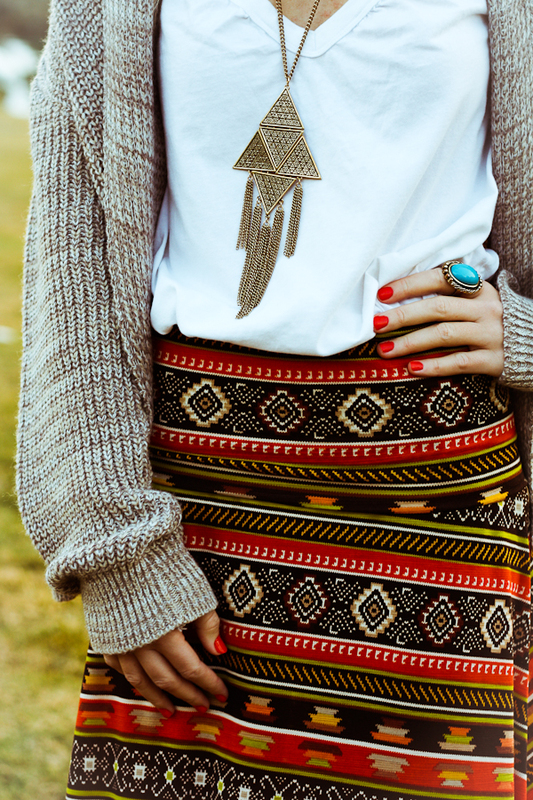 Seriously, I've been crushing on everything tribal lately, and this takes everything I love and puts it into one outfit! in love with the sweater! if you ever sell it let me know! !